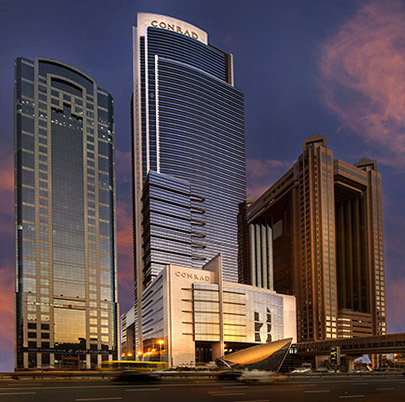 Conrad Dubai has some of the finest dining in the city. The Italian-inspired Ballaro restaurant offers an international buffet for breakfast and lunch, à la carte Italian cuisine in the evening and a Mediterranean Brunch every Friday. Escape to the chic and luxurious pool bar, a truly hidden oasis in the heart of Dubai where you can sip cocktails and enjoy delicious, healthy meals in a lush, tropical setting. Wine lovers will be spoiled for choice in our Cave wine bar, which is known for its style, coziness and urban wine cellar with over 1,500 international wines available, complemented by tempting cheeses and Parisian soul food. This luxury hotel near the financial district has direct access to the Dubai World Trade Center metro station, making it convenient for travelers to discover Dubai with zero hassle.